Athens, Georgia – Kentucky fights hard for 82-77 win over the Georgia Bulldogs, in a tough battle between two really good teams. As in most arenas throughout the Southeastern Conference, the Georgia fans were hyped for a big time contest with the Kentucky Wildcats. A near capacity crowd helped by a couple of thousand Kentucky fans, made the atmosphere electric. Georgia’s little senior point guard JJ Frazier got the Bulldogs off to a hot start with six early points to give Georgia a quick 8-5 lead with 15;00 minutes to go in the half. 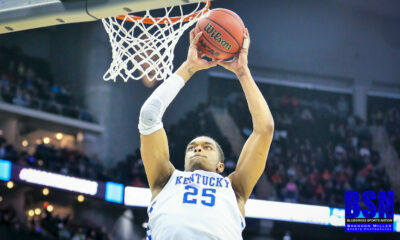 UK started out shaky with two early turnovers and missing five of their first eight shots. 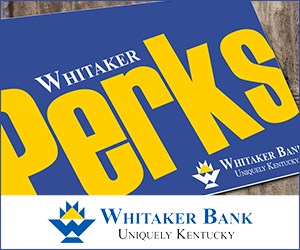 Despite the bad shooting by both teams, Kentucky did go on a small roll with back to back three pointers by Derek Willis and Mychal Mulder to give the Wildcats their first lead 10-8 then 13-8. A very favorable home whistle for the Bulldogs sent DeAaron Fox to the bench with his second foul with less than ten minutes gone in the half. Followed closely with two fouls by Wenyen Gabriel at 5:46 and Dominique Hawkins at 5:02. Georgia had some bad luck in the first half when Junior Forward Yante Maten went down with a knee injury at the 18:24 mark and did not return to the game. With seven seconds left in the half and the Wildcats leading 33-28, the men in the striped shirts struck again. Willis had made a steal and Georgia’s Derek Ogbeide ran into him, which should have resulted in a foul, but the officials called walking on Willis instead and to the dismay of all the blue cladded fans in the arena. Georgia took advantage of the bad call when Frazier hit a 3-pointer for the Dogs as time expired, closing the halftime lead to two at 33-31. Frazier ended the half with 14 points. Although you never expect to get good calls on the road, the bad officiating continued at the start of the second half when Isaiah Briscoe was called for an offensive foul when replays clearly showed that the Georgia player had flopped with no contact. With 16:44 Malik Monk and Georgia’s Mike Edwards were both given technicals when Monk went to the basket and appeared to be fouled, but no call was made and Edwards got into Monk’s face to brag about his block. Georgia took the lead at 53-52 with 9:14 to go in the game, but the Wildcats fought back and regained the lead at 59-57 with two Monk free throws with 6:17. In a nip-n-tuck finish, the lead went back and forth until Bam Adebayo blocked a shot by Georgia’s Juwan Parker with twenty-seven seconds left in the game. After the blocked shot, the ball was retrieved by UK’s DeAaron Fox who was immediately fouled. Fox made both free throws to give UK a 77-75 lead that they would not relinquish. Georgia made UK win it at the line as they fouled the rest of the way, but UK only missed one on their way to the five-point win. Georgia’s JJ Frazier was star of the game, despite going down in defeat. The Georgia senior had 36 points and almost single handedly beat the Wildcats. For Kentucky it was a difficult game as they only shot 40% from the floor. 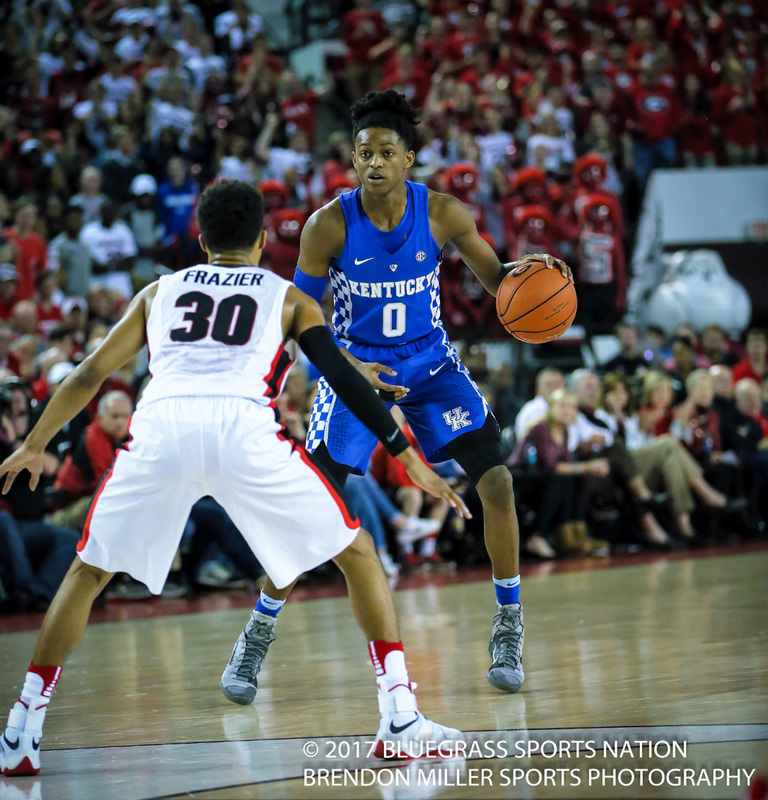 But in the end it was the toughness of the Kentucky freshman guards as they fought through a bad-shooting night and still pulled out a win. Kentucky was led in scoring by the dynamic dual of Monk and Fox, who had 16 points apiece. Senior Derek Willis had a good game with a team leading 12 rebounds and he was 3 for 3 from the field for 7 points. The win keeps Kentucky tied for first place in the SEC with a 12-2 conference record; they are now 22-5 on the season.